A retired Tauranga couple who had their motorhome, worth more than $100,000, stolen and then torched by a 21-year-old local man are disgusted he has received only 20 months jail. The Welcome Bay couple aged in their 60s, who do not wish to be named, told the Bay of Plenty Times Weekend that Jordan Hall’s jail sentence was woefully inadequate. They had expected him to get at least four to five years’ jail. Part of Hall’s 20-month sentence includes time for stealing a solo mother-of-four’s uninsured car, which he subsequently crashed. It also comes on top of a two years and three months jail sentence he received on August 27 for aggravated burglary and cannabis possession. The aggravated burglary charge related to Hall waving a wrench at woman after she discovered him on her Waitaha Rd property on July 31, before running off. Hall was sentenced in Tauranga District Court last week by Judge Louis Bidois, after he earlier pleaded guilty to charges of arson, burglary and unlawfully taking a car. Those offences were committed between July 15 and July 18 this year. The court was told how on July 15, Hall had stolen the 7.3m motorhome from a secure lockup in Brook St and drove it to an associate’s rural Oropi property, and then abandoned it after it became stuck in a swamp. The motorhome was subsequently recovered by police and towed to Rowe Motors but three days later, at 2am, Hall climbed the security fence and set fire to a mattress inside the motorhome before fleeing in another vehicle also stored at the yard. 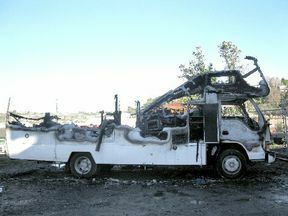 The motorhome was gutted in the ensuing blaze. The owners of the motorhome said that when the vehicle was first recovered it had been completely stripped and trashed inside. “I’d just completed servicing the motorhome and cut and polished it ready for our holiday this month, and when I was first told it was stolen my stomach dropped through the floor,” the man said. Always make sure you have a good, valid motorhome insurance policy!